Iris Corp Bhd is a Malaysian based company. It operates in five divisions. Trusted identification Division offers e-passports, e-identification cards, banking cards, transportation and other related trusted identifications devices and equipment. Property Development and Construction sub-division are engaged in the construction of buildings and modern integrated farms and manufacturing of Koto industrialized building systems. Food and Agro Technology sub-division provide provision of food and agro-produce and equipment. Environment and renewable energy provide provision of waste management and power and energy-related systems. Education Division offers the provision of academic, tertiary and professional courses. It generates the majority of the revenue from Trusted identification Division. Cryptotrader Next month which day release Q4 result? Bull13 Good chance of getting IC project and get back passport project from Dsonic. 40s is no problem. itch Is it the real deal this time???!!! 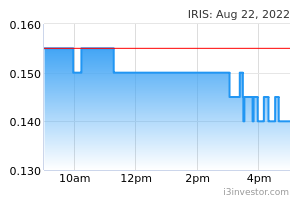 Cryptotrader Iris got something. I tot is just a one day wonder. I all in iris now.. Wish me good luck. lbhock123 Orang pancing ikan ? T800Terminator Joke of the day. Newcummer1 The only possibility is to build affordable houses in BM. Newcummer1 This time is different , Slowly up. Long George After breaking the resistance of 16sen, momentum seems to be strong and positive. Long George They are gonna hit their 52 week all time high soon! Amukutty Long George what is their 52 week high pls. itch 20 cents coming by next week! lbhock123 I tell ya what's brewing... Water-fish soup ! itch This is the year we shall make big money with Iris. Robin and VT wont come in and leave their money go idle ! They are deal makers!!! wotvr Lol. Whenever a counter becomes active, all the jokers come out. LightOfTheWorld Yesterday volume 141k only up 1.5 sens. Today volume 29k down 1 sen.
itch 0.29 will do nicely too!